Mega Man III is a Game Boy game in the Mega Man series. The game features four Robot Masters from Mega Man 3 and four from Mega Man 4; the plot says that they were rebuilt. More gameplay elements locate Mega Man 3 (GB) after Mega Man 4 and before Mega Man 5: the Rush Marine is not featured anymore, but Beat is not featured yet. Mega Man 3 (GB)/Rockman World 3 is a rather obscure game released between two well-known games. 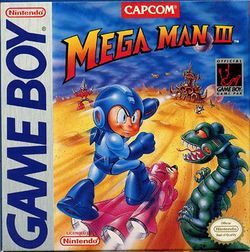 Indeed, Mega Man 2 (GB)/Rockman World 2 is infamous as the lowest point in the classic Mega Man series, while Mega Man 4 (GB)/Rockman World 4 is the most innovative game in the series (it introduced at once the W-cans, the P-chips/bolts and the shop). Between these extremes, Mega Man 3 (GB) is a classic game based on the most classic of all, Mega Man 4. This page was last edited on 3 December 2015, at 00:21.